Well, it’s that time of year again, Halloween! A special time of year where we get to dress our pets up in silly costumes, eat endless amounts of candy, and enjoy “Trick or Treater’s” in their scary costumes. Now, clearly this sounds fun for us. But, let’s face it, it mat not be fun for our dogs. Here are some tips for this “scary night” on how to keep your dog happy, healthy and sane. I’ll admit it, dressing your dogs up in costume is HILARIOUS! There are so many creative ideas. Pugs in Starbucks outfits, Dachshunds in-between two hot dog buns, Wolfhounds who look like Wayne and Garth and so much more. As much as I get sucked into this trend, I still need to keep my dogs in mind when dressing them up. Now, I go all out every Halloween for my dogs. I spend weeks sewing their costumes and for what? Honestly, for a good laugh. Let’s face it, most people probably would not want a crowd of their peers staring, pointing and most certainly laughing at them. 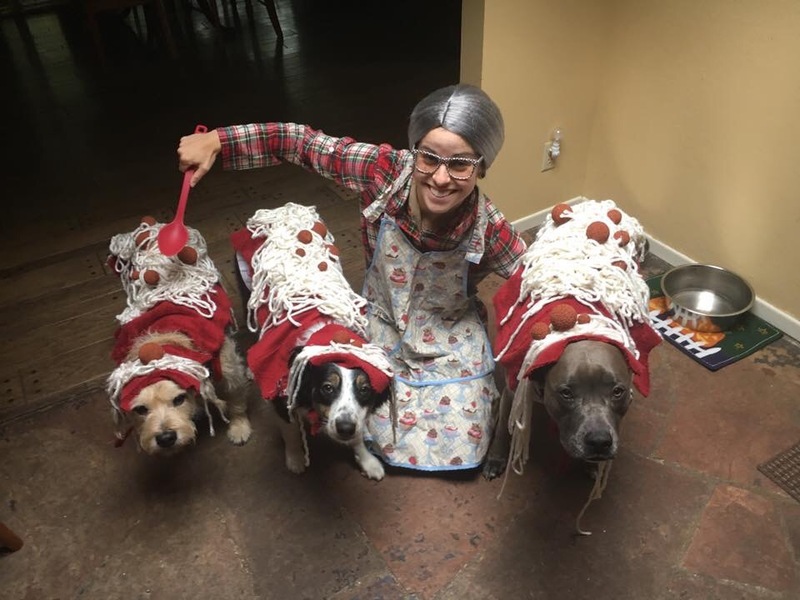 As much as I enjoy Halloween, I have to keep costume time fun when it comes to my dogs. Because, let’s admit it, it’s not very fun for them. Every time my dogs allow me to put these ridiculous things on their bodies, I am dishing out the “doggie treats”. Letting them know they’re being a really good boy/girl and that “Mommy” is crazy! Before I attempt to take a picture I allow them to get used to the costume. Brain games come in handy. Commands like Sit, Down, and Watch Me, do help to take their minds off the costume. Once I notice they are feeling somewhat comfortable, all it takes is a quick SNAP from my smart phone to capture the cuteness and then it’s over. When I strip them of the costumes we begin Family Fun Night. I cheer them on, rile them up, basically letting them know what “good sports” they were and how much I appreciate them letting me have my fun! If your house is like mine, you know all about the barking at the door. Yes, reader’s, my dogs bark at the door! They bark, jump and are basically a “hot mess”. When we know guest”s are coming, we use proper management tools. Kennels, puzzle games and baby gates for the most part defuse the chaos. It gives us a chance to let each dog out one-by-one to meet the guest and allows us to have a solid routine for them. However, when Kim and I are surprised by visitors then so are the dogs. Halloween is literally the only time of year our door bell will ring multiply times in one night. Kim and I love Halloween! This year we do want to welcome “Trick or Treater’s” so this means extra planning on our part. We’ve decided to put them up in their kennels 15 – 30 minutes before the chaos with their TREATS, bully sticks and Kong Stuffers and leaving the TV in our room on loud. Actually, this is the routine we implement every time we leave the house and they need to be alone. Alright, you did it!! You got an adorable photo of your dog in a lobster costume. And you also got through the night without the dog wanting to scream at every “Trick or Treater”. Now it”s time to prop your feet up and eat some left-over candy. My only reminder is to BE SMART! DO NOT have that extra glass of wine, fall asleep on the couch and drop the bowl of “Kit-Kat’s and Milky Ways all over the floor for your dog to have a “midnight” snack themselves. Dark Chocolate is verg poisonous to dogs when consumed in large amounts. Plan ahead and have a few pieces for yourself and safely store the rest of your extra sweets where “Fido” can not reach them. Enjoy yourself this “spooky” season and remember to find ways your dog can too!